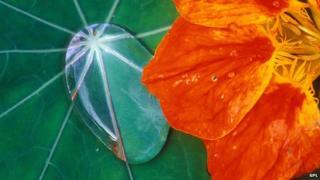 US engineers have created the "most waterproof material ever" - inspired by nasturtium leaves and butterfly wings. The new "super-hydrophobic" surface could keep clothes dry and stop aircraft engines icing over, they say. The lotus leaf was thought to be the gold standard for staying dry in nature, but now a team from MIT in Boston say they have surpassed it. Adding tiny ridges to a silicon surface made water bounce off it 40% faster than the previous "limit". Similar ridges are found in nature on the wings of the Morpho butterfly and the veins of nasturtium leaves. By applying these patterns to metals, fabrics and ceramics, the scientists hope to inspire a new generation of moisture-resistant products - from tents to wind turbines. "We believe these are the most super-hydrophobic surfaces yet," said Prof Kripa Varanasi, whose work is published in Nature journal. "For years industry has been copying the lotus. They should start thinking about copying butterflies and nasturtiums. "I'm looking forward to working with the fabrics industry to develop new clothing that stays dry longer. What will be the next Gore-Tex?" The faster raindrops bounce off an anorak, the drier it stays. We need to bring in the clothing designers - can you make a fabric that has these new features? The quicker they roll off a power line, the less chance of it corroding - or freezing over. Following this principle, the scientists filmed droplets hitting different water-resistant surfaces - and measured how long they "stuck". On lotus leaves, each drop landed in a perfect "pancake" - then quickly springs back in a single symmetrical droplet. The "lotus effect" has inspired industrial fabrics, paints and roof tiles, which mimic the nanostructures on the plant's leaves. Their secret is their high "contact angle" - only a tiny area of the droplet ever touches the material surface. To go one better than the lotus, Varanasi and his team shifted their focus from contact angle to a new paradigm - contact time. They designed larger (macroscopic) structures that actually increase the area of liquid touching the surface, but make the droplets bounce off faster - by shattering each one into asymmetric pieces. When they applied these ridges to aluminium and copper oxides they repelled water 40% faster than the lotus leaf - as did the nasturtiums and the Morpho wings. At super-cooled temperatures, water bounced off these metals before it had time to freeze - a useful property in aircraft engines. Applying these textures to turbine blades in power stations and windfarms could significantly boost efficiency, Prof Varanasi believes. "The key challenge is durability" he told BBC News. "Most super-hydrophobic materials are fragile polymers - they don't stand up to abrasion, or high temperatures. "But combining our textures with stronger materials - such as metals and ceramics - we can overcome these durability challenges." Adding these extra waterproofing features to materials is not difficult, he says. The ridges can be produced by ordinary milling tools, making the process scalable to industrial levels. The designs could also be woven into textile fabrics, he believes. "Sportswear, lab coats, military clothing, tents - there are a whole range of situations where you want to stay dry," he said. "Now we need to bring in the designers - how can you make a fabric that has these new features?" His lab team plan to take their concept and optimise it to produce even more water-resistant structures. "I hope we can manage to get a 70 to 80% reduction [in contact time]. There's a lot of room left," said Prof Varanasi. "For example, our studies used single ridges. But in butterfly wings you have ridges that are intersecting - they break droplets into four. "The more pieces you break the droplet into, the more the contact time goes down." Anyone doubting his claims would do well to examine his track record for innovation. His lab recently created the award-winning LiquiGlide - a coating that gets every last drop out of a ketchup bottle. "We're looking for our next big venture," he told BBC News. "We have just opened a window into this world where people really think: what is super-hydrophobicity? Can we go beyond this? "There could be other species in the natural world which are even better."